At your service! Built to last, this rugged, no-nonsense, folding cart is here today and will be still here tomorrow too. 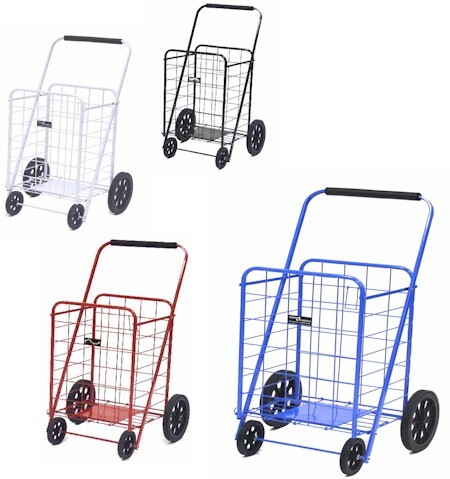 Like other folding, metal, shopping carts Big Bruno folds flat except for the wheels. The Big Bruno weighing in at sixteen pounds is strong enough to carry 250 pounds of whatever it is you need to transport, whether it be groceries, camping gear, books - no matter what! Roll and stroll with this cart as the wheels have one inch wide, solid rubber tires to cushion your trip through the grocery aisles. The soft, dense, foam cushion on the handle will be easy to grasp and comfortable even for those with arthritic hands. Our Big Bruno Folding Cart is sturdily constructed of steel painted with a highly durable, epoxy finish. The cart is reinforced with an ultra-strong 12" x 10" steel plate which provides additional structural support. 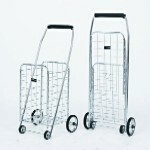 Among our line of folding carts, Big Bruno is the strongest and heaviest cart we carry. The cart stands 41.75 inches high, 24 inches wide and 21 inches deep. The basket's dimensions are: 24" high x 17" wide and 14.5" deep. The rear wheels are 9 1/2 inches in diameter and the smaller front wheels are 5 1/2 inches in diameter. The tread won't come off these wheels because the tires are solid rubber. This cart is not a good choice for a shopping cart if intended for an elderly or frail individual. And as always, these carts are not intended to be a substitute for a walker. Unless you are a strong individual, if the cart has to be carried up and down stairs, lifted into the back seat or trunk of a car or carried onto a city bus, this may not be the best cart choice for you. 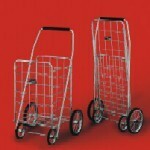 Please feel free to call 888-833-8875 for assistance in selecting a folding cart. This folding cart, like all folding carts is not appropriate to be used as a walker, or to "steady" someone who is unsteady on their feet. PLEASE NOTE: All shopping carts ship via UPS only within the United States! Please choose UPS as your shipping method at check out! For International shipping, all shopping carts ship via UPS Worldwide choices ONLY! Please choose UPS Worldwide options available to prevent delays in expediting your order! If you chose the Big Bruno Cart With Deluxe Hooded Liner, please select your choice of the liner's color. I purchased this cart for my 92 year old grandfather for Christmas. He is moving into an senior living community and needed a way to transport things to and from the car and to take care of his laundry. The cart is not as durable as I thought it should have been for the price. I doubt that it would hold 250 lbs. I also purchased the liner for my grandpa to use for his laundry. It is very cheaply made. It would be best to find a canvas duffle that will fit into the cart. Overall, pricy for what you get. I think a more reasonable price would be $50. I've had my Bruno for over a year and put a lot of weight and miles on it. It's held up just fine! When it works it is great but must replace the cotter pins .on all 4 wheels as they are too short. ElderStore Response: Perhaps the customer assembled the cart incorrectly as we have only had this complaint one other time. We have sold over 1,000 Big Brunos.